I really feel I am getting close to the point in development where I need real artwork for the game. All my programmer and stolen art is looking and feeling rather disjointed. However to get artwork I need to pay someone. So my thinking is that if I could use kickstarter to get some money to get the game some real artwork. However... After some serious looking at failed and successful projects I can see that I am not yet ready to do a Kickstarter campaign. People back projects on how they look more than anything else I can see (once they have been made aware of said game). My game looks like crap, or close to it right now. Most like this will put people off backing it, rather than seeing that the game is going to be finished and should be a fun shmup. In this day and age I would have thought video of the gameplay would be enough to get backing, but I am not certain why.. but it doesn't appear to be the case. You have something like less than a second to make a first impression, so if my current artwork is their first impression, how can I expect them then to imagine my game with glorious graphics? Along the same lines as the last point.. This is my game and will be the artists game. Why should I expect potential backers to see the potential and glorious looking game I do in my minds eye? This is after all not their baby, or even their focus. I do not have enough followers to get enough publicity if it doesn't look amazing. Not enough followers equals failed, unless your artwork can be mentioned by people saying how cool it looks. As for people mentioned how cool it will look, well that is absurd. So I need some artwork to display for my kickstarter.. Geez. I have a 20 level game already and 8 Aliens that are all sort of like mini bosses themselves. I will keep working on Space Invaliens and hope that I can figure out how to acquire an artist without breaking my bank. In the mean time I have some work to do on another title and then I'll be back to my Space Invaliens and getting GameCenter in it for the iOS. Posted by VoodooChief at 1:52 PM 0 comments Not Ready to Kickstarter? I love Fraps, it has been my video recording friend now for a number of years. Since I got into XNA and XBLIG development. Fraps was a great buy (and still is) for recording my gameplay videos and development videos directly from the simulator. Well last night I tried hard to do the same thing in the Marmalade simulator, and though I have done this before, this time I get a yellow flashing constantly. It looks like some kind of clear screen as it is a blank yellow frame. I am not certain at this point how to remedy this, but I was hoping to show some gamplay elements from the now 20 levels that are setup for the Space Invaders inspired game, Space Invaliens. Hopefully I can sort this tonight by using an alternative openGL rendering setup (Marmalade offers several flavors). Posted by VoodooChief at 10:39 AM 0 comments Fraps rocks, but gah! Here is a demo of me showing off the difficulty setting in Space Invaliens. I start out by setting the difficulty to 25%, and there are few bullets from the alien 'Arnie' as he is affectionately known. Then I alter the difficulty and set it to 99%, called ridiculous in the setting menu. Space Invaliens- Arnie Difficulty demonstration from Robert Toone on Vimeo. I have to admit that some of my ideas come out really well. In fact they really exceed my expectations. The difficulty Dialer in Space Invaliens is one of those ideas. I finally solved all my bugs and now the slider works and the implementation is in and working. Simply put, I have a slider in the config screen. You can set the game to Zero difficulty(easiest) all the way to 100 (ridiculous). this means you can set it to any integer in between as well. Slowly incrementing the difficulty of the game. as I said, it has worked out so well. The game truly is Ridiculous at a difficulty of 100, and at zero, it is rather boring for me. I took the value from the difficulty dialer (slider) and converted it to a percentage. This was then inverted and used to multiply with the random drop rates of the aliens bombs. Thus making the higher difficulty reduce the chance of not dropping a bomb (I know that sounds awkward, but it works). So with a multiply value of zero it Always drops a bomb at the basic rate I have setup for each alien. I also used the same technique on the spawning of the enemies special firepowers. To the same result. The game can now be set to interesting for nay skill of player. Oh, and one more thing I have to add to this. The incentive to be good, is that I multiply the score you are receiving by the difficulty level divided by 10. So want a high score? Well as you get better that is gonna happen. After a couple of playtest sessions where I methodically wrote down notes while playing each level. I have balanced the first 10 levels to a ramp of difficulty I am happy with. They are now extremely easy.. but I am now a very experienced player. Hopefully this curve will work well for novice and new players. Of course this got me to try and hook up the difficulty setting from the config page, especially as my mate Jeff was haranguing me about it being too easy. Well I hooked it up and although I had this part planned a ways back, it in fact doesn't appear to alter the difficulty of the levels in any significant way.. I am most perplexed. I guess fixing this will be my next priority. Then It will be onto fixing a few bugs I noted along the way. booorrring! But after the bugs I shall get to write more Aliens and more Alien firepowers. Yeeehaw! Posted by VoodooChief at 11:13 AM 0 comments Testing not playing! It seems I have a confession to make. I have been playing Space Invaliens for several days now and supposed to be balancing the difficulty of the first 10 levels. As it happens they are balanced.. only they get a bit difficult a bit too fast. I need to take down the difficulty ramp a LOT, and to do that I have several variables that is pretty easy to adjust once I know what I want to achieve for each level. So playtesting is necessary for each level to be brought to the correct setting. However I am doing a bad job, and so incidentally is my daughter who is also trying each level and finding that the challenge of difficult levels is quite thrilling and also rather exciting. I really need to test these levels a lot more than playtesting them. Then maybe I can finally finish up these first 10 levels and move onto creating some new aliens I have to get on creating. I suppose at the least seems like fun haha! Posted by VoodooChief at 11:00 PM 0 comments Testing or Playing? The best idea I have had in the last week was to plug in some numbers and try them. My experience in making games tells me that I should do certain things. Like not bite off more than I can chew, and my intuition also tells me that I should probably not spread myself so thin mentally. Yet time and again I make the same mistakes, only usually I get over them faster each time. This was not one of those times. Still, here I am with new numbers plugged in. What I got was information, some great stuff, like my powerups were coming in way too slowly, and also, that they were too powerful once bought. From this information I was easily able to go to the next step. I broke down my powerups to give me more granularity. So for example I had two bullet sizes, now I have 3. 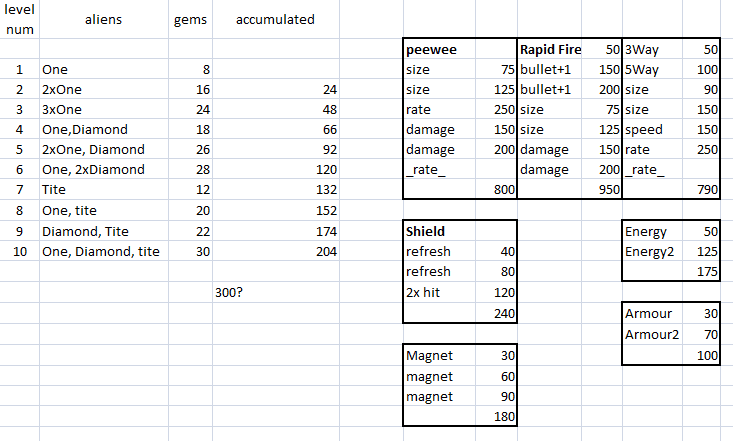 Also I have rate of fire and damage, which now both sport 3 levels of upgrade. This allows me to sell more packages to a player which is more interesting, and also be able to balance the progression through the game better as each upgrade is not phenomenal. Cost wise it is great to make the bottom tier so low, but then ramp up the costs as the player really progresses. In the game the number of gems you can earn per level goes up with level as well to match. I am still tweaking the new cost table I have created, but one more pass should see the peewee fire options and ancillary options set. Then I will move onto multiway fire I reckon. I will post the table once that part is stable. I also have the issue that although the game ramps up in difficulty really nicely, the ramp is simply too steep, and by level 11 it feels more like level 30 difficulty.. argh! On a side note, I still do not have my 4th firepower type, though I do have several ideas I am not exactly happy with. Here is what I am currently working on. The layout of the costs of all the upgrades for the Space Invaliens game. On the left you can see my first 10 levels and the aliens that inhabit it, also how many gems will drop on that level for the player to collect. Now I will mention here that I have types of buyable Items. Fixers which are cheap and throw away, Upgrades which are permanent for you ship, and enhancements which are purely cosmetic and do not influence the gameplay. I originally wanted a player to earn the in game gems currency and buy the items in the shop. Then when they have bought it, it is theirs for all their games. This means they power up their ships rather than just the ships in game. However the reality is that the items are simply too expensive if I do it that way, and it is simply off putting.. So now I am going to do the same as most games, and simply let you buy powerups for your ship as you go.... Though at this time I am still considering a 4th type of buyable package, the account package. (for another blog post methinks). So back to the chart above. I know what Items I have for sale, and Yes, I can always add more levels of size, or fire rate or damage etc. The main thing is that I want the player to buy the stuff in whatever order they want. From my personal design point of view it is hard to setup though. The choices I would make are not necessarily the ones another would make. I think this is great but is in fact a hard thing to fathom the balance of all the costs to show it to be a fairly even and open setup. I might be a rapid fire type of guy, but the next player might be a 5 way fire type of person, desiring the more protective multi-way firepower over the focused firepower I would choose to wield. I really want the game to be balanced well enough that whatever route they go, it is as good as the next, so it is more a playstyle choice, rather than the only way to victory is one tech tree etc. 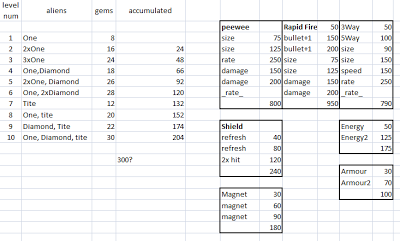 In the game the firepowers are quite comparable, but working on this table of costs for the upgrades is a pain in the proverbial to me. I just do not feel comfortable setting this out yet, but I need to have something to test with. So my current thought is to simply put in some numbers that seem viable and then go play the game and see what happens. If I manage to get the balance right between the upgrades, then I will only be left with how quickly people get the gems and what level they will most likely be maxed out. Balancing the upgrading too slowly and make it boring, with too quickly and making the game too easy is proving to be difficult. This last weekend was my next marketing exercise. Last time you may remember I offered one of my book apps for free. Well this time I wanted to be less generous and see what happened. My expectations were not high, but I hoped to sell maybe 10 copies of the game. As it happens I have no graph to show you what happened over the weekend reduced price days, or even the several days after. There is no need you see, as the game never sold any copies. None, Nada, Zilch..... Very disappointing. Now of course this is a niche product and one I believe to be unique on the App Store, and also for young children. Still I had hoped for something. This has to be one of my smallest Blog posts, still I have learn't something.. exactly what I am not certain. Ahhh difficulty in games. It is such a personal and subjective thing. No two people can generally agree whether the difficulty of a game they have just tried is same. This is because experience counts for so much when playing game. Practice does not always make one perfect, but it can certainly make you better at whatever task you are practicing. Such a platform jumping, or dodging bullets in the latest shmup. One of the things I found out when doing A Shooter and Pellmell is that a lot of people with Xbox360s are not great at dodging bullets in shmups. This is because the genre is not as well covered in main streams games, or at least not over here in America. I see most of my sales have been going to the East since their launch, no real surprise. This however leaves me with a dilemma. I need to make the game interesting enough for practiced shmup players, yet easy enough for novices to get going. This is a very thin line, and might be impossible to balance on. that will not stop me from trying to walk it though. As well as the starting difficulty, I also have to work on the difficulty curve. This is where most of my time is usually spent on a game. Balancing the ramp up of difficulty to remove bumps and troughs. I want to ramp difficulty so people can brag to each other about how far they have gotten, and personally I love the challenges of playing a game that ramps up the further you get in. this kind of Genre begs to have this system in place. I am currently working on having all my aliens fire by calling a single routine, in that routine I will evaluate the difficulty level of the game alongside what level you are currently on. Then I will make the determination not only if I should fire the actual bullet or not, but also if I should speed up, slow down, alter size of, or simply fire a different type of bullet. With this and a lot of tweaking I hope to do most of my difficulty curve coding in a single function. Here is a simple table version of the last several months. This is from when my solar panels were turned on. As you can see I am steadily making more kWh as the days are longer and there is less cloud from the winter months. I obviously hope this to carry on and we don't end up paying anything for electricity till this coming winter. Also by then I am hoping that we have some kWh extra from the summer months in the bank. I like not having to pay anything to Edison each month, and only pay the American solar Direct lease of $55.40 each month. I do have a more informative excel file, but I am not sure any more is needed than what is above. Please realize this is a 20 year lease and although the electricity price is constantly going up, I won't have to suffer too much of that with my fixed lease costs, and hopefully never leaving the tier 1, price per kWh.